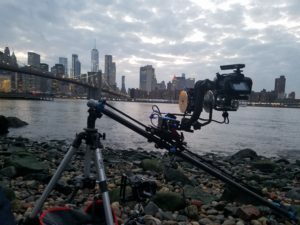 Sunset at Pebble Beach A focus pull motion time-lapse of the sunset over the Brooklyn Bridge, One World Trade Center, Jane’s Carousel and the New York, New York skyline captured from Brooklyn Bridge Park. This capture was about an hour and a half of time and 1400 images. The equipment I used was a Dynamic Perception Stage One slider, custom tilt head and focus motor.